5.4" x 4.4" x 1.4"
Add color, reduce expenses. One size does fit all. Whether your workgroup is large or small, the RICOH Aficio SP C242DN color laser printer can meet your specific color output requirements, improve productivity and reduce total cost of ownership. This innovative color laser printer streamlines workflow with a host of standard features that simplify administrative and maintenance tasks. Its compact size and user-friendly controls are ideal for any organization that values space as well as its bottom line. 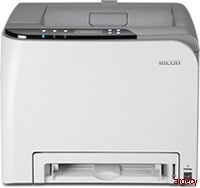 It even uses less power than other printers in its class. Choose the Ricoh Aficio SP C242DN as your office's workhorse printer or incorporate it as part of an integrated Managed Document Service (MDS) strategy and improve efficiency. Expedite print queues and manage multiple jobs with ease via a powerful 400 MHz controller and 256MB RAM. An optional external wireless Ethernet adapter simplifies shared use in expanding offices. 15.7" x 17.7" x 12.6"